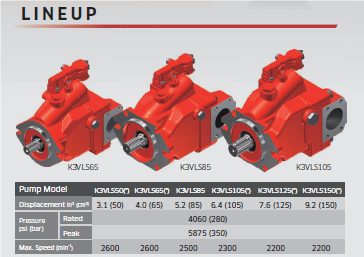 The Kawasaki K3VLS medium-duty hydraulic pump (series K3VLS65, K3VLS85 and K3LS105) is a highly energy-efficient swash plate axial piston pump used for load sensing in various hydraulic systems. 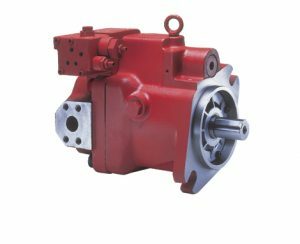 This hydraulics pump, available through Advanced Fluid Systems, is ideal for machine and equipment used in construction, agricultural and other industrial vehicles and mobile applications. The K3VLS series offers high pump efficiency in the low and intermediate pressure ranges, as well as superior control properties in a compact design. Displacement ranges from 3.1 cubic inches up to 5.0 cubic inches are available. The K3VLS85, which has a displacement volume of 85 cm3, is ideal for the light weight and compact installation required in industrial vehicles. Compared to existing model K3VL80, it contributes to easy installation and fuel efficiency improvements through a reduction in pump weight of approximately 15% and an increase in output density ratio of approximately 8%. The K3VLS is equipped with load sensing control and constant pressure control and responds to a wide range of requirements with electrical flow and horse-power control options. The series also comes with a pump mounting compliant with the SAE standard. See the diagrams for more information on specifications. For more information, or assistance with your application needs, please email solutions@advancedfluidsystems.com.